Corey Vink can feel the emotion welling up inside every time he embarks on a new whale watching adventure as a naturalist with Orca Spirit. “It still gets to me,” says Corey. One of the rewarding parts of his job is that he gets to share that experience time and again with visitors from Victoria, Vancouver, and all over the world. 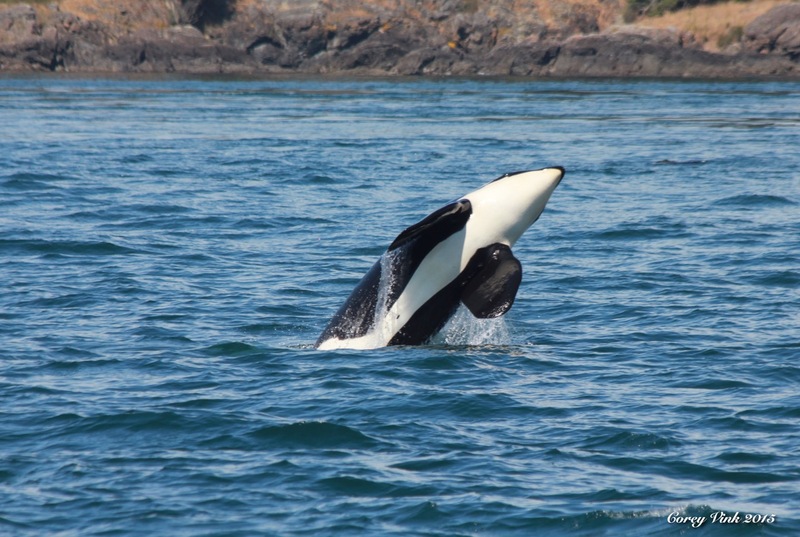 We caught up with Corey at the start of another busy whale watching season to learn more about observing killer whales in their natural habitat. How long have you worked for Orca Spirit? Corey Vink: This is season 14 for me. So yeah, I’m a grizzled veteran all of a sudden. I’ve always been interested in orcas. I have a degree in biology, but before I officially applied with Orca Spirit, let’s say somewhere between 1997 and 2001 I was an At Sea Observer so I spent a lot of time on the water. I knew they were hiring so I submitted my application and eventually they gave me the opportunity and all of a sudden it’s 14 years later. What’s your favorite marine animal? If it’s orcas, then what’s your second favorite? My favorite marine animal is indeed the Orca, but in particular I’m a big fan of the Bigg’s killer whales, the mammal hunters, and then I guess a close second would be humpbacks. It’s the two animals we see the most at Orca Spirit so maybe that’s why they’re my favourite. It’s really one of the big reasons to go whale watching in Victoria, you see both on a regular basis. You said you have a degree in biology. What is it that drew you to this line of work in in the first place? Does it ever get old seeing orcas and humpbacks and all the other animals off the BC Coast? It really doesn’t. I still see things after 14 years that blow my mind and get me excited. This past Sunday is a prime example. We had 20 orcas right behind the boat, transient killer whales probably pursuing porpoises and things like that. When you see the power these animals have and also get a chance to see those more intimate moments of the family – it’s still so incredible. Sounds a little terrifying, I’ll be honest with you. (Laughs) It’s just powerful. I haven’t been in any situations yet that scared me. You can tell they’re intelligent and they care for their young, and they might have a bit of curiosity when it comes to humans, but we keep a respectful distance and allow them to do their thing without interruption. What’s the mood like on a cruiser when you’re pulling out of the harbour – I imagine there’s a lot of first-timers. A lot of people we have, it’s one of their lifelong goals to go whale watching in Victoria. Most of the time they come out quite excited to be on the water. I’ve never really thought about it like that before – yeah, for a lot of people that’s a goal in their life is to be able to see an orca whale and you get to deliver that. It’s a bucket list item for many people for sure. One of the coolest things about a whale watching tour in Victoria is looking across the water to see Seattle and you see Washington State and all of a sudden you realize the Orcas and humpbacks and all the other wildlife, they don’t really care much for the Canadian / American Border. What does it feel like to be part of something that’s so important and an experience that’s so thrilling for so many people? I enjoy meeting people from all over the world. I enjoy educating people and hopefully making them aware of the conservation issues we face. And now no matter where in the world we’re from, healthy oceans are critical to all life on the planet including our own. So I try to throw that conservation message in there as well.